The pictured Ashton Credenza is built in rustic cherry with Seely stain. The pictured Belmont 4 Drawer 1 Door Credenza is built in rustic cherry with Seely stain. The pictured Belmont 4 Drawer 2 Door Credenza is built in rustic cherry with Seely stain. The pictured Belmont 55" Credenza is built in rustic cherry with Seely stain. The pictured Belmont 6 Drawer Credenza is built in qs white oak with Asbury Brown stain. The pictured Belmont 60" Credenza is built in rustic cherry with Seely stain. The pictured Belmont 86" Credenza is built in rustic cherry with Seely stain. 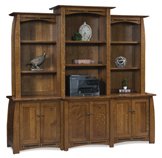 The pictured Belmont Wall Cabinet is built in brown maple with Tavern stain. The pictured Boston Credenza is built in quartersawn white oak with Michael's Cherry stain. The pictured Boston Low Credenza is built in qs white oak with Michaels Cherry stain. Pictured in rustic cherry with FC-N3173 New Carrington stain. The pictured Bridgefort Mission Credenza is built in qs white oak with Michaels Cherry stain.